Today at Walgreens, my life was changed. Finally, someone has invented an EGG CRACKER. For years, I haven’t been able to eat eggs. Like most Americans--or, so we must assume based on the existence of this product--I simply couldn’t figure out how to get the damn things open. Many hours have I spent just staring at a carton of eggs, locked in a battle of wills. Sometimes, craving a Western Omelet, I would weep silently to myself, cursing the eggs and their damned impenetrable shells. It seemed as though each egg was mocking me. Taunting. Beckoning. Like an egg-shaped version of Fermat’s last theorem. Fortunately, your handless relatives can use EZ Egg Cracker with their feet!! It’s that easy. No, seriously… An EGG CRACKER. I thought I was hallucinating. I don’t watch a lot of TV commercials these days, so maybe this is being touted on every channel. For $19.95, it seems like there must, certainly, be more involved. Maybe it comes with a Slanket? Maybe it also slices, or dices, or writes poetry? Apparently not. And you have to wonder what marketing geniuses were hired to think up the catchy name for this project. 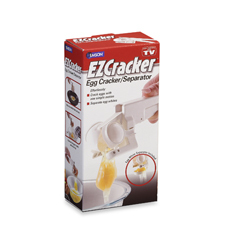 The EZ Egg Cracker. Seriously. Someone must’ve pulled an all-nighter on that one. “EZ, as in … easy!” Marketing Dude beams, pausing for effect. “Get it?? And Egg Cracker, ‘cause it, you know…” His voice trails off. The product name seems willfully ironic. Am I the only one on earth who thinks that separating an egg yolk is alarmingly easy?? So easy, in fact, that I have to admit that I learned how to do it from watching re-runs of Three’s Company. Sadly, I’m not joking. I was about eight years old, and my favorite show was Three’s Company, which was enjoying an inexplicably long run in syndication. I knew my parents vaguely disapproved of the show, but not enough to forbid me from watching it. I thought this had something to do with the content, and all the adult jokes I (supposedly) wasn’t getting. Only later did I realize that my parents’ objection wasn’t moral so much as aesthetic. It was a profoundly stupid show, written by and for people who were either under the age of 10, or seriously tweaking on cocaine. (Or, in the case of the young Drew Barrymore, both.) Since my parents were neither of these things, they didn’t see the point of the show. If you never saw it, Three’s Company was about a guy named Jack who decided to move in with two platonic female friends (a revolutionary idea at the time, if you can imagine), but the landlord didn’t want any “funny business.” The main conflict involved convincing the landlord that Jack was gay, even though … (hold your breath!) …. he wasn’t! Yup. That went on for years. And years. There was even a spinoff, if I remember correctly. And yet. From Three’s Company, I learned the following Life Lessons: 1) To separate an egg, simply pour the yolk from one half of the shell into the other over a bowl. 2) Blonde, buxom women are inherently more attractive than any other kind. 3) Gay people are just funny. At least one of these lessons was helpful later in life (the thing about gay people, of course). The early-to-mid 80s was the High Renaissance for sitcoms with the premise: “X is forced to move in with Y!! Frequently, this involved men pretending be women/gay/German Shepherds, etc., in order to live in a reasonably priced apartment. In most cases, the Complicating Factors totally negated any possible cost benefit. Like in Bosom Buddies. Tom Hanks and Some Other Guy had to pretend to be women to live in some women-only apartment building. (Because, you know, that’s the only way anybody can find an apartment.) Fortunately for them, it was a time before driver’s licenses or Social Security numbers, or any of the other things they usually check when you rent a place, but whatever. Men were strictly forbidden in the building, so the two guys had to dress up like women each and every day. Coming and going. Think about it. The wigs, clothing, waxing, etc. – how much would this have cost?? Not to mention having to get into full drag every time you wanted to go down to the bodega to buy a bag of chips…Even at age seven, I couldn’t get past the question: Wouldn’t it have been a lot cheaper to just live somewhere else? But my time watching 80s TV wasn’t entirely in vein. Thanks to Three’s Company, I’ve spent a lot of years successfully cracking a lot of eggs, and separating the yolks. I’m clinging to that. I didn’t waste my childhood watching and memorizing the details of ridiculous TV shows. Right?